Investing in silver bars is a preferred method of wealth protection among many precious metal enthusiasts. 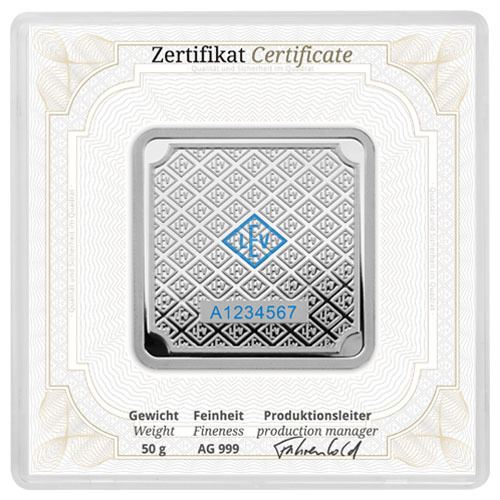 Geiger Edelmetalle is one of many global refining operations focused on the production of investment-grade silver bullion for precious metal buyers, and the new Geiger Original Series of square bars is a unique option available to all. Right now, 50 Gram Silver Geiger Square Bars are available to purchase online at Silver.com. Ships to you housed within individual security capsules and a certificate of authenticity! Issued as part of the Geiger Original Series! Consists of 50 Grams, or 1.60754 Troy ounces, of .999 fine silver. Obverse includes the design of Schloss Guldengossa, the headquarters of Geiger Edelmetalle. Reverse features a repeating LEV rhombus logo and serial number. Available for inclusion in Precious Metal IRAs. Each of the 50 Gram Silver Geiger Square Bars listed here is available to you for individual purchase or in bulk orders. Single bars are shipped inside of security capsules that feature a security label to enclose. Bulk orders are available in tubes of 30 bars or boxes that house a total of 240 bars. Tubes and boxes are also sealed with security labels by Geiger Edelmetalle. The Geiger Original Series of gold and silver bullion bars offers greater variety to any investor. The gold range of bars runs from 1 Gram to 1 kilogram, while these silver bars in the collection range from 1 Gram all the way up to 5 kilograms in total. The design on both sides of the bars is the same regardless of metal, as are the use of security features to combat counterfeiting. 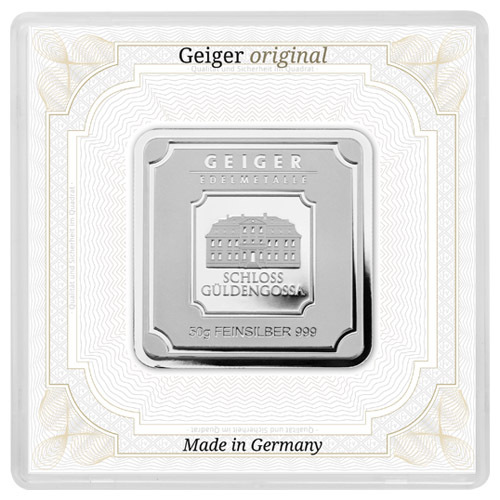 On the obverse of 50 Gram Silver Geiger Square Bars you’ll find the stamped design of Geiger Edelmetalle’s corporate headquarters at Schloss Guldengossa. The castle is located outside the city of Leipzig, Germany, and was the first registered building of the modern refinery. This side of the bar bears a pearl finish for enhanced security. The reverse of the Silver Geiger Square Bars features a repeating LEV rhombus logo. This is used by the refiners at Geiger Edelmetalle, and this face of the bar also has a unique serial number engraved in a one-letter, seven-number digit code. In the center of the bar there is an LEV rhombus you cannot see which becomes visible only under black light. This UV coating and that on the serial number offer another layer of protection against counterfeiting for Geiger products. If you have any questions, please don’t hesitate to ask. Silver.com customer service is available at 888-989-7223, online using our live chat, and via our email address.